This Anti-Flu Juice with fresh turmeric, ginger, red chili, oranges, carrots, lemon and sweet potato contains all you need to make your own cold and flu home remedy. It can help you to get rid of your cold if you have one or to keep a cold at bay when you are feeling a bit under the weather. Ginger and honey are well documented to boost the immune system. Ginger and turmeric are both anti-inflammatory and natural pain killers. Ginger contains very potent anti-inflammatory and antioxidant compounds called gingerols. The health benefits of turmeric are derived from curcumin, the substance in turmeric which provides its yellow color. Curcumin has very powerful anti-inflammatory and antioxidant properties. Sweet potato, oranges, chili and lemons are loaded with Vitamin C. Vitamin C-rich foods help fight off infections and reduce the severity of cold symptoms. Chili peppers contain a substance called capsaicin, which helps fight inflammations. Chili, like ginger, is also a natural pain killer. Chili is also a good source of Vitamin C and beta-carotene, which the body changes into vitamin A. Carrots and sweet potato are also rich in beta-carotene. Vitamin A (converted from beta-carotene), often called the anti-infection vitamin, plays an important role in preventing colds, flu and other respiratory illnesses. Vitamin A is essential for healthy mucous membranes, which line the nasal passages, lungs, intestinal tract and urinary tract and serve as a defence against bacterial and viral invaders. As such, it helps to fight off common flu symptoms like nasal and chest congestion, a runny nose, coughing and sneezing. If you feel a cold coming on this Anti-Flu Juice will give your immunity a gigantic boost. If you are already down with the flu, start juicing right now. This Anti-Flu Juice can help you beat your flu or reduce the severity of your cold symptoms. Juice all produce! Add honey and enjoy! 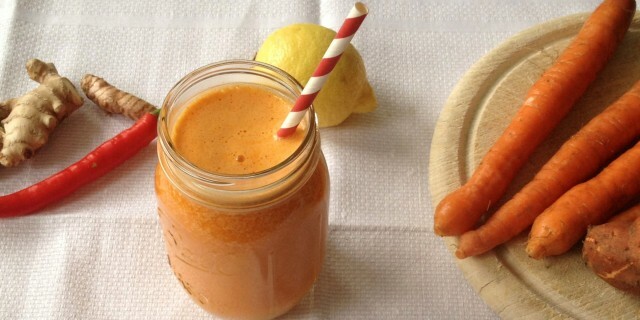 One Response to "Anti-Flu Juice"
Super goed recept…lekker en werkt echt ! !